On a clear crisp October day, where better to be than at Maywood, with a kaleidoscope of leaves floating earthward? And what better things to do than sawmill and introduce a new family to the wonders of beekeeping? Top it off with a dinner of grilled bluefish caught last weekend in Cape May, N.J. and we’ve got the perfect Maywood day. John has been a busy sawyer lately. Word of mouth has directed several guys to bring tree trunks to our place for John to mill. John’s lumberyard (literally, the part of our yard dedicated to lumbering) smells sweetly of fruity sawdust. Today’s project was to mill a mantelpiece. Originally thought to be pine, the wood turned out to be sassafras. The pleasant surprise meant milling the rest into boards for woodworking rather than 2×4′s for more mundane use. 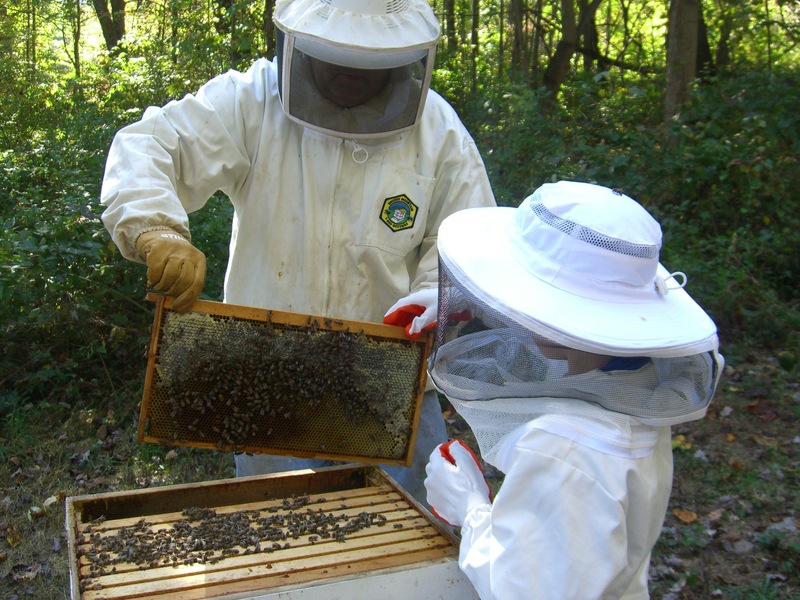 No sooner had the sassafras been cut, then it was time to do some apiary education. 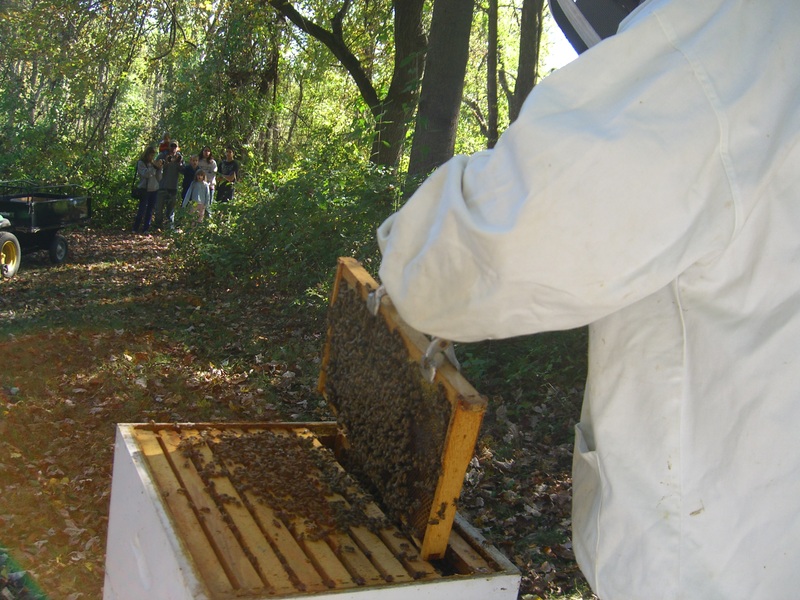 Today we planned one last peek into the hives to check for any harvest-able honey. A colleague from school wanted to watch, as he is thinking of getting some hives for himself. He came along with his wife and six children. The oldest, a student in my French II class, brought a camera along to work on a digital photography project. 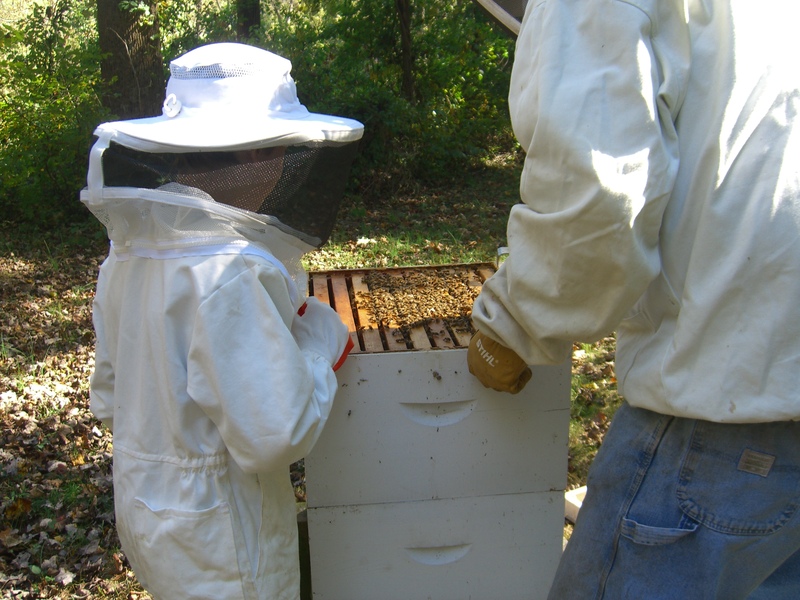 The middle kid, Hunter, was just the right size to sort of squeeze into Harper’s bee suit. He was also the most reluctant to be near the bees, but the only one who could wear the suit. “Trust me, you’ll be fine,” I said. He covered head to toe, zipped in so tight he couldn’t scratch his own nose. The suit was a little short, but a pair of tube socks pulled up over the pants legs more than handled the gap from shoe to calf. Then, he was drawn to the hive, fascinated by the thousands of bees. It didn’t take more than ten minutes for the bee-wary boy to have his face right up to the frames, staring down into the hive. Alas, there was no honey for the humans to harvest today. What’s there is what the bees need for the winter. The hives were closed up and it was time to call a bee-day. We sent them on their way with honey and lip balm, then went inside for a late lunch of some fresh eggs they had brought us. 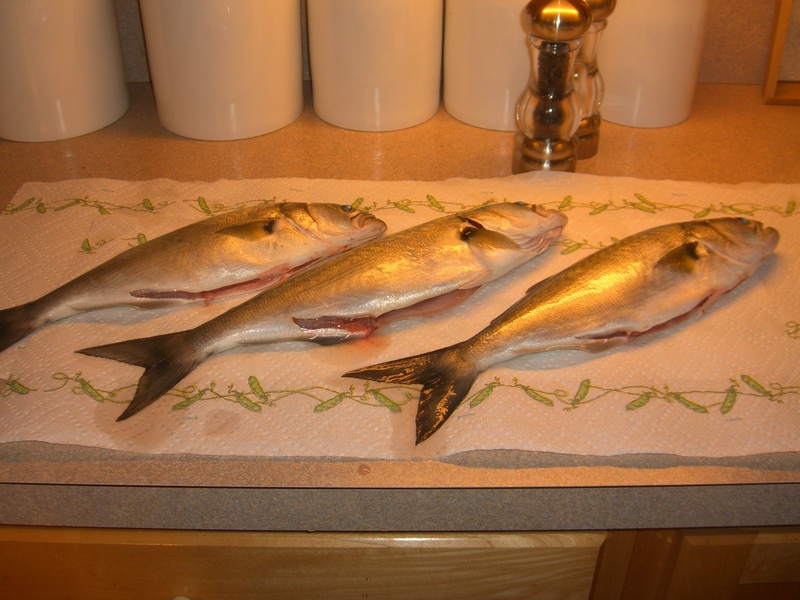 Later, John grilled his bluefish, seasoned with salt, pepper, and lime, over some applewood and then topped it off with cranberry-dill sauce. Good weather, good projects, good company, good food. What a good day. And, oh yeah, I even got the laundry (mostly) done. This entry was posted in Mondays at Maywood and tagged Bee Keeping, Bees, Country Living, Family, gardening, Hereford Zone, Home, Kathy Harp, Maywood Living, Mondays at Maywood, Recipe, The Zone Magazine. Bookmark the permalink.